Hazrat Babajan famous Saint of Pune known as Perfect Master or Sadguru of Meher Baba . 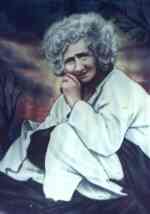 Hazrat Babajan (Balochi: حضرت باباجان‎) (unknown - 21 September 1931) was a Pashtun Muslim saint considered by her followers to be a sadguru or qutub. Born in Balochistan, Afghanistan, she lived the final 25 years of her life in Pune, India. She is most notable as the original master of Meher Baba. According to one observer, within a decade of Babajan taking residence "the [Char Bawdi] locality underwent a metamorphosis surpassing all expectations. What with the featural changes in the buildings all around, electrified tea-shops ringing with the clatter of cups and saucers, a concourse of peoples consisting of all ranks and creeds waiting for Babajan’s darshana, a street bard entertaining the crowd with his music, the beggars clamouring for alms, easy-going idlers standing indiscriminately hampering vehicular traffic and the whole atmosphere heavily laden with sweet burning incense perpetually kept burning near Babajan, presented a scene typically Eastern, leaving an indelible impression on one’s memory."